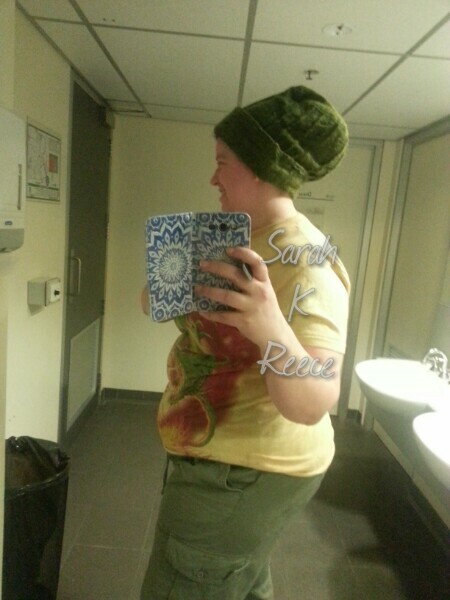 Took this photo in the bathroom at college today when I realised I looked like a green haired Marge Simpson… I’ve been working on a lathe and other equipment where dangling hair could get me scalped, so I put my dreads up them covered them with this gorgeous yak wool beanie from Nepal. When I put my dreads right up on the top of my head like this, I’ve got quite a bit of height going on! I’m into the last 3 weeks of this semester. I have 2 essays, 3 artworks, and 3 journals due. It’s packed in and needing my total attention. I’m flourishing. I’m hitting my stride and finally finding my feet. I’m also rapidly recovering from my sinus infection, which is fantastic. I was told, after the surgery, I’d still get them but likely get over them fast, (previously they went bacterial then crashed my immune system so I got everything else too) and that’s holding true so far… Fingers crossed it still works for me over winter. Working hard and learning many new skills. Can’t wait to show you, I’ve got a handmade art book, a wooden doll, and a tactile rain stick in development. I’m so content to be developing as an artist. I’m home, I’m home, I’m home. I can be what I really am and still make a difference in the world, still be an ethical and responsible citizen, using art as a language to say the things I want to say, using it to keep me sane and keep me mad in ways that don’t destroy my life. Keep that spark alive. I wanted to go out to the post card fund-raiser for NePal tonight after college but my mind and body were saying ‘home’. So home I came. I’ve cut the dead roses back, done some weeding in the soft wet soil, planted out a rose I gave to Rose for Mothers Day, put out the bins, and cleaned something pink off the car. (did someone throw a drink over it? No idea) Rose and I are cooking pasta and waffles for dinner together and then cleaning the kitchen. There’s a purr of happy contentedness in my chest. Is this what learning your own rhythms feels like? Tuning into the language of body and brain? It’s the most wonderful thing. It feels like I’ve finally learned how to follow the steps of a dance I’ve been doing wrong all my life and now it just… Flows.